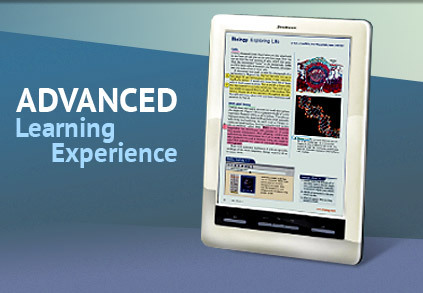 ECTACO, Inc. and E Ink Holdings partner to bridge the gap between students and eTextbooks with the jetBook Color, the only color E Ink educational eBook system developed specifically for schools. This new device is now being implemented into New York City's largest high school - Brooklyn Technical High School. ECTACO, the preeminent handheld language translation company, has developed and distributed devices and linguistic software in over 200 languages since 1990. E Ink Holdings is the world's largest supplier electronic paper displays. 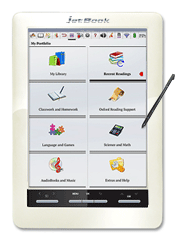 A natural union of both companies occurred when ECTACO developed a dedicated eBook reader - ECTACO jetBook Color - which carries the highly regarded concept of "healthy reading" and features an E Ink Triton color ePaper display. 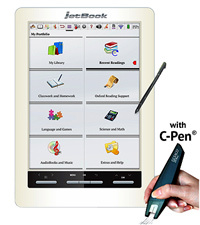 The jetBook Color was conceived by ECTACO to provide schools with benefits that cut costs and increases student productivity. 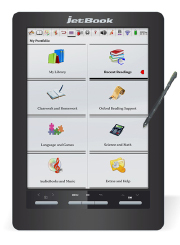 In addition to being the only touchscreen color E Ink eReader in the world, it's preloaded with many academic tools and resources such as talking dictionaries and SAT prep courses; Math, Physics, Chemistry, Geography, and Biology references; graphing, accounting, and scientific calculators; multilingual talking translators; fluent Text To Speech for all books - a useful feature for students with dyslexia - and more. Most significantly, it enables schools to add their own content in a multitude of formats at no additional cost. This means that every eTextbook purchased can instantly be loaded to the jetBook Color, along with any notes, homework, and other reading materials. The revolutionary color ePaper display delivers a high-contrast, sunlight readable, low-power performance that further closes the digital divide between paper and electronic displays. This is the only eye friendly type of display developed exclusively for the education community. Brooklyn Technical High School has a reputation of being at the forefront of progressive education. By using the jetBook Color in their classrooms they've continued the trend. Instead of lugging around suitcases of books, students will be equipped with units weighing just 1 pound and capable of storing every textbook for every class and more. 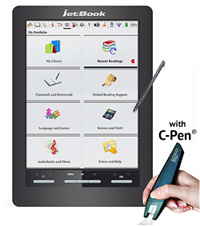 Students will also have the ability of using the jetBook Color as a notebook where they can freely write on the screen using a supplied stylus that fits into the device. This methodology eliminates textbook defacement and allows students to study how they want without the fear of ruining or losing textbooks. 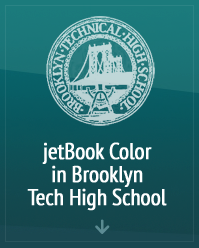 "With the tremendous success we've had in schools across Europe using the jetBook Color, we're glad we can do the same thing here in New York City", states David Lubinitsky, CEO, Ectaco, Inc. "And with Brooklyn Tech picking up the device we look forward to even more schools following the trend in making both student and teacher life easier and more successful." Contact Greg Stetson at Greg@ectaco.com or 718-728-6110 for more information.